The best soup starts with the best stock and the best stock is made of simple ingredients and love. The tastiest meat is closest to the bone and should never be wasted. Whether you’ve roasted or BBQ’d your chicken, the leftover carcass is worth saving to make stock. We’ve gotten into the habit of buying chicken breasts with the bone-in… when we get home we remove the bone and save then to use later (freeze ’em). When we need to make a stock, we thaw them and usually have enough to make up to 12-16 cups of stock. 1. 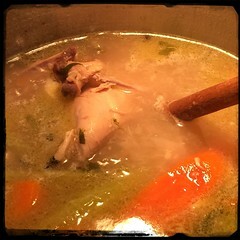 Place the chicken carcass or parts in a stock pot and fill with water until the carcass is covered. Bring to a simmer but not boil. 2. Add onion, carrots, celery, and bay leaves (and optional hot pepper) let come to back to a simmer once again. 3. Add bay leaves, parsley, 1 teaspoon pepper and 2 teaspoons of salt, stir and lower heat to medium. 4. Taste broth often while adding salt (and water) to obtain good balance. When adding water, add 1 or 2 cups at a time, always bringing broth back to a simmer before adding more. 5. As you’re adding water you can also add 1 or 2 tbsp of olive oil. 7. When broth taste is as desired, add 1/2 cup of water, let come to boil and then lower heat. Let simmer for at least 30-60 minutes before remove vegetables, chicken bits and carcass. (We recommend, if time is available to let this simmer for hours!). 8. Let cool down and strain the stock, separate chicken from bones and save the cooked veggies (mash ’em and use ’em later – here’s a sample of what we do with the leftover veggies and meat…Cauliflower With Chicken Soup Purée or Broccoli with Chicken Soup Purée).